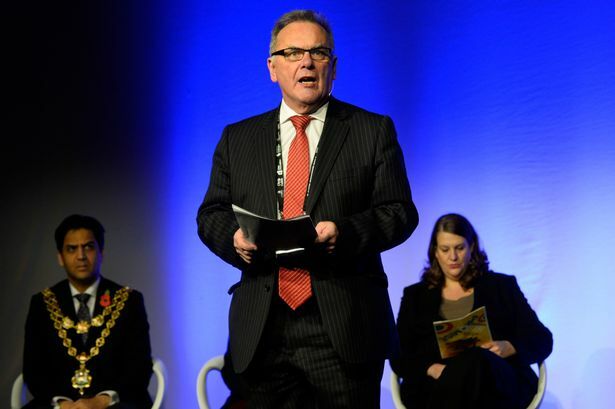 Birmingham City Council leader Sir Albert Bore has said there was "no dissent" when it came to choosing a name for the proposed West Midlands Combined Authority. Business leaders in Birmingham and the Black Country have insisted that &apos;Greater Birmingham&apos; was the only name which would attract global recognition for the new authority. But it is understood the leaders of the other six metropolitan councils were fiercely opposed to the name and it was eventually described as a &apos;deal breaker&apos;. The name West Midlands Combined Authority has now been officially adopted and Sir Albert said he was happy with the choice. He said: "The Greater Birmingham name was from the local enterprise partnership. "We&apos;ve all agreed, there&apos;s been no dissent that the combined authority will move forward with the name West Midlands. That&apos;s appropriate, everybody is happy with that. The name is a distraction. "What this is about is bringing the seven metropolitan districts together, in a combined authority that will drive the economy of the West Midlands. Let&apos;s put the name to one side, it&apos;s an irrelevance in many respects." Sir Albert also indicated he wanted Warwickshire&apos;s five district councils and the county council to be involved in the new combined authority. Warwickshire&apos;s district councils recently formally requested to be engaged in talks around the combined authority. The preference of the seven metropolitan councils is for Warwickshire to join as &apos;non-constituent&apos; members, rather than full members, at a later stage. Initial talks with Warwickshire officially began last week. However, some of the county&apos;s council leaders have since said their preference remains an alliance with Coventry alone, away from Birmingham. Asked how important Warwickshire was to the new combined authority, Ann Lucas, leader of Coventry City Council, said: "They&apos;re incredibly important to Coventry. Coventry and Warwickshire are like rhubarb and custard. They&apos;re also incredibly important across the region and, whatever happens, we will continue to work together. "But I&apos;m incredibly hopeful they will come on board and be part of the combined authority."